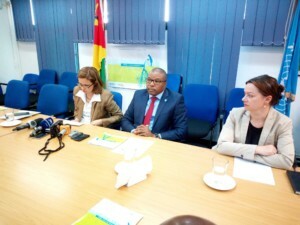 On 16 October 2017, in the margins of the celebrations of World Food Day, the United Nations World Food Programme (WFP) national director, Karin Manente, claimed that Mozambique had met the first of the Millennium Development Goals (MDGs) which was to cut by half the number of people suffering from hunger between 1990 and 2015: “It was about 56 per cent, and now it’s 24 per cent”, she said. “There’s an improvement. And with the investment policies that exist, the prospect is that Mozambique can reach zero by 2030. That’s the great effort the country is making with the support of the United Nations and other partners”. Manente, reminded that WFP is focusing its support for Mozambique on resilience to climate change and on long term social protection in order to meet the target of “Zero Hunger” by 2030. She added that the WFP is helping the government draw up policies to confront problems of food and nutritional insecurity: “The plan intends to ensure that people have access to nutritional foodstuffs and held them become more resilient to the climate shocks to which Mozambique is ever more prone”. WFP estimates that 25 percent of the 28 million people in the country means that seven million Mozambicans still live in the shadow of hunger. “There are already national policies and programs” to eradicate the problem, Manente admits. “What we need now is to operationalise them,” and get all those involved moving from words to practice. It may seem easy, “but it is not,” she say, because “there is a lot of work to do” to ensure that food reaches everyone routinely. SDG 2 governs the WFP’s strategic plan for the next five years in Mozambique, a plan that anticipates an annual budget of EUR 140 million (still to be raised) to support an average one million people per year. Most of the money goes to direct food distribution through delivery in kind or through vouchers to redeem in the markets. ‘#Mozambique Can Meet #ZeroHunger Target’ @WFP Chief @redaellimanente #WorldFoodDay2017.